A refreshing backdrop for Media City UK. It has been just over two years since the start of the march to the Media City UK in Salford. The first BBC departments moved from London to the North West in February 2010, followed by the remaining departments in the following months and years. The BBC move is complete and Media City now homes ITV Granada, The University of Salford, children’s programmes and soon the new Coronation Street. But from what I can gather, a chain of a popular coffee shop franchise is the real winner. Whenever you think of Media City, you don’t automatically consider the huge scale the project has actually been. Many might think the ‘beeb’ paid a few builders to erect some fancy buildings and moved in within a few months. Wrong. The site, on the banks of the Manchester Ship Canal, had been derelict since the closure of the dockyards in the early 1980’s. Peel Holdings bought the plot of land and did no more. In 2003, the BBC announced it was considering moving crucial departments away from London to Manchester. Talks began about constructing a new “media village” in collaboration with ITV Granada, the North West’s strand of ITV. A number of possible new sites were considered, but it was Salford Quays was chosen. The area, over years, has seen considerable development; The Lowry Centre, office blocks and museums had already started to revive the former industrial setting. The move to Salford was confirmed in 2006. Around 1,800 jobs would be relocated, according to the then BBC Director General, Mark Thompson. Construction on the new site began in 2007, with the announcement in the same year that departments including BBC Sport, CBBC, Radio Five Live and BBC Breakfast would all make the journey to the northern capital. I have had the pleasure of visiting the attractive site. Media City UK boasts buildings that house the production departments of key BBC programmes, whilst The Studios contain several high definition studios and the BBC’s Philharmonic Orchestra. Other buildings include modern apartments, flexible office space for media and creative industries and The Orange Tower which houses The University of Salford and ITV. The site is very impressive. The architecture and abstract design of the buildings is quite an eye-opener. The ‘airy’ and open feel of the village is very different to the brick and mortar that once occupied Oxford Road in the heart of Manchester. The “media village” feels iconic and a part of new media history. But it is easy to see why people don’t appreciate the site. Some residents have objected to the site being built, whilst others have relished in its good fortune. Some jobs have been created over the years including in the construction of the site, whilst inside the companies that now occupy the buildings, jobs have been offered for local residents and apprenticeship schemes to aid to the young members of the Salford community. However, a recent committee hearing told how just 39 new recruits out of 350 jobs going were from the Salford area. Whilst this news may cause an upset between the media complex and local residents, it is clear that Media City is more than just a hub housing some of the nations best known programmes. It is a vital organ for the regenerated Salford community. Since it’s construction and opening, Media City has brought a new wave of tourists to the former docks; the sector seeing a boost in visitors for the seventh consecutive year. But whilst the construction has been fairly speedy, the cost of relocating existing staff has angered licence fee payers. The recent closure of the BBC’s iconic Television Centre was reported as being a part of huge savings for corporation. Departments including BBC News and radio moved to the New Broadcasting House in Central London, whilst other departments had moved to Salford, Glasgow and Cardiff, amongst other areas. The Public Accounts Committee recently grilled BBC executives about the cost of the relocation for the core departments. The top bosses at the beeb continue to insist that the entire project came in under budget, but there are still questions over the relocation packages offered to staff, some of which had to move home from London to the Northern region. BBC trustee Anthony Fry admitted that there would be “raised eyebrows” over the pay of £1million to just 11 staff, whilst the cost of relocation for around 900 staff had nearly toppled £25million. Whilst it may have been a cheaper option to move North, it is clear that the cost to the licence fee payer is great and it’s unlikely that the packages paid out will be repaid in a couple of years. Tony Morris and Lucy Meacock look above Media City in the Granada Reports studio. But what about programmes themselves. Do they feel any different? No. 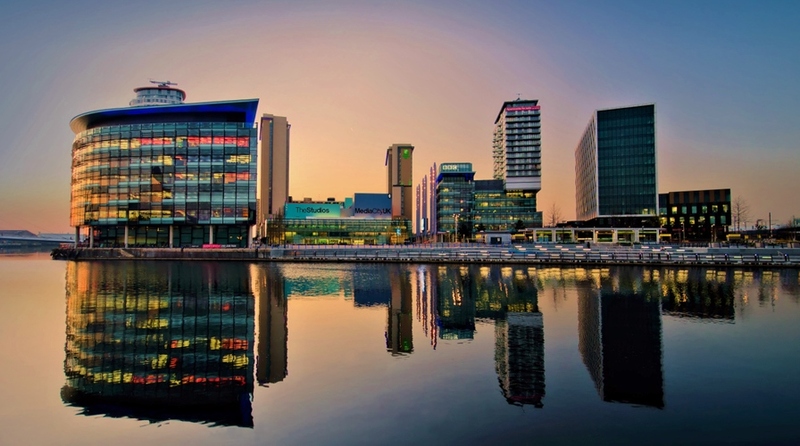 Whilst ITV’s Granada Reports is now broadcast from a new state of the art studio in The Orange Tower, the programme still feels like it should – a regional news programme, with a live backdrop of the piazza and canal at Media City. Production at ITV is completed on the seven floors that the corporation occupies in the building, so content is unlikely to feel any different. Even the new Coronation Street set, currently being built within the complex is an exact replica of the former set in Quay Street. Viewers won’t notice a difference. Over at the BBC, just a few hundred yards away, the story is very much the same. BBC Sport broadcasts from a new newsroom with no onscreen indication that it is close to Manchester city centre. Nor does Match of the Day, broadcast from Quay House, which feels more like an evolution of the previous theme. CBBC and Cbeebies feel identical to the previous studios, as does BBC Breakfast which could still be confused as to being in London. As for radio, surely nobody would notice the difference? For viewers, content remains the same, high quality broadcasts that have always been provided. The base for the actual production teams is now just in a new location. Costing less than operating from the heart of London. Good move. The BBC has made a good deal in suggesting a “media village” collaboration because it’s one of a kind in the UK. The cost has run into millions and to the average viewer they won’t even notice the difference. Bu the setting, atmosphere and entire surroundings of Media City feel pleasant and vibrant. Media and creativity at its highest level. The build probably has been worth it. Even on my first visit I was taken back by the grand scale of the buildings and the knowledge of what was being produced and what will be produced in the future. Media City is more than what meets the eye. It is a community bridge and an environment for learning and development. What is certain is that thousands of tourists will continue to flock, year in year out, to visit the complex. 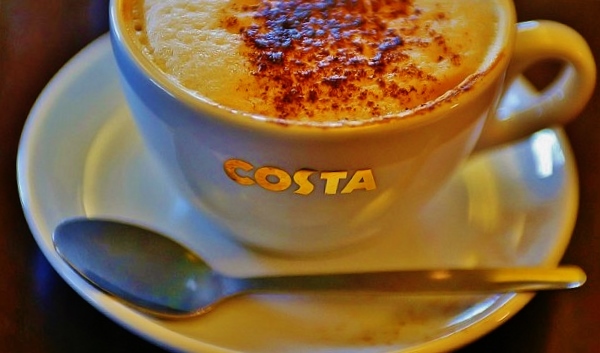 Costa Coffee hosts tourists and staff alike. But out of all of the names who are on site, there is only one winner. Costa Coffee. A small branch squeezed between the BBC buildings and The Studios. For the visitors, studio audiences and tourists, the branch is ideal for a snack or drink to break the day. For the staff of Media City, including journalists, presenters and production staff, the shop is a way of getting out of the office for a light refreshment. And on the odd occasion, you may just spot some famous faces having a coffee before filming. An ideal location for an ideal chain to bring tourists, enthusiasts and professionals all into one place. A mirror reflection of what Media City UK stands for.